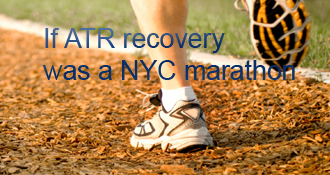 bigcatchronicles has completed the grueling 26.2 ATR miles to full recovery! Goal: 362 days from the surgery date. Hello all, I hope everyone is progressing through therapy and slowly making it back to a (somewhat) normal lifestyle. It’s interesting to me that I really don’t notice progress day to day, but when I look at it from a weekly standpoint, the progress is very noticeable. The last few weeks I have really been focusing on my gait, specifically, making sure I am trying to push off my right foot at the back of my stride instead of doing the flat footed “boot walk”. It is nerve racking at first and even still now a little bit when I push off that back foot slightly and feel the tendon/calf muscle firing. I tried doing flat ground calf raises with both feet and was happy to feel no pain and that my muscles in my leg fired equally. After about 5 to 10 however my right leg was tired, but that’s something I can work on! I had a concert and a wedding this past weekend which proved to be quite the test on my leg. I wore a light ankle brace for extra support which helped and I felt pretty good other than a little swelling I had on Sunday. Not to worry, a little ice and elevation took care of that! Keep your head up and stay positive! Week 12 came and went and I am happy to say that I have not used the boot at all this week, so I feel confident to say that I am ready to put in the deepest darkest confines of the basement. I am able to walk pretty well in comfortable sneakers with a small lift, however, it is easily apparent that I have a limp still. The best exercise really seems to be simply walking, it helps stretch the tendon out and begin building back those muscles in your calf and foot. I had a big test this weekend that made me very nervous to tackle, but I was very successful. My friend planned a night out at the casino and as you may know, that requires a good bit of walking and standing. I felt confident I would be able to do it without the boot so I decided to go for it. Of course, I did do something to protect myself slightly. A few weeks ago,upon advice from others, I purchased a bauerfiend achillotrain ankle brace. I put on my dress sock first and then the brace that did a great job of stabilizing and protecting my ankle especially since I was not used to wearing a dress shoe. WOW with the brace on, even my friends commented that I had no limp at all. It felt so great to walk around without feeling restricted or the stares the boot brought me. Once you are cleared to weight bear either in the boot or in a shoe, find a safe area to start walking and get to it. I have to give much of the progress achieved between week 10 and 12 to walking in the shoes and boot whenever I could. Keep your head up and stay positive. Hey everyone. So sorry I haven’t really said too much on the blog, however, that doesn’t mean that I haven’t been reading everyone’s posts! I finally wanted to give a little update on my progress. It’s promising how a few weeks and hard work can change your entire lifestyle when you have injuries such as ours. So I am now full weight bearing now for a couple weeks and have begun going to two shoes. Today at PT, my therapist expressed her surprise as to how much better I looked walking from week 9 to 10. It felt so good to hear someone comment on how well I was doing as opposed to most who make fun of my funny limp steps. So those that are reading this close to the same post op time frame or close by, you will know the feeling of taking first steps in normal shoes. I put on my shoes and got up and started walking around my kitchen and couldn’t help but to start laughing in pure joy. Going from waking up the second day post op in excruciating pain to walking in two shoes again is awesome. Now I will continue to work on walking, the push off and begin strengthening the muscles through therapy and biking here soon. I can’t stress enough how vital a positive attitude is when you go into a phase of your life that can have so many negatives. Just a quick post about getting around while you can’t walk, because we all know the most frustrating thing is the immobility that comes with this injury. I read almost everyone’s posts about what is best: crutches, iwalk, scooters, walkers, etc. and of course I started out with the crutches you are given from the doctor that were designed in the 1800s. These crutches (even with the amazon applied under arm pads) lasted maybe a week before I was like, THESE ARE GOING TO KILL ME. So, I decided to invest in the iWalk. Do not get me wrong, I really liked the iWalk, it is an awesome resource for those of us that are up and at em all day. It’s comfortable, relatively easy to use, and good quality. However, my problem with it was that I want something that will get me where I need to be and than be out of my way. You have to constantly put it on and take it off because you can’t sit down with that thing protruding out in front of you like that. So I used mine for mainly outdoor type activities, and I never took it out in public. The biggest turn off for me with this system was simply this: I don’t care who you are, at some point you will either trip, or you will have to grab onto something on your way down, and I didn’t want to take that chance. I was told to get Mobilegs by a friend of mine and wow what a difference when it comes to crutches. To be honest, I don’t think there is an easy way to get around on one leg, but for someone who is younger, in good shape, it was the best choice. For the same price as the iWalk, I had an extremely comfortable pair of crutches that made getting around a breeze, not to mention, I enjoyed the arm workout I got hahaha. I highly recommend them to someone that doesn’t want the scooter and refuses to accept they will fall with the iWalk. I in no way work for mobilegs, I just want people to know of a product that helped immensely. If anyone needs any help with this dilemma, please feel free to message me. I wish I would of reached out to someone who had gone through it all when I was just figuring this out. Stay positive, and keep your head up. Hello to all at the blog and thank you for creating such a resourceful place where people can go to get real answers to all of their concerns. Unfortunately, I come to you after a full rupture of my right Achilles from playing indoor soccer. I had made a cut up field and was going to shoot when I heard the loudest pop I have ever heard. I tried getting up and looked at the ref looking for the foul, because it felt exactly like I was kicked from behind. As I tried getting up and realizing that wasn’t possible, I noticed that I wasn’t fouled, and that’s when the panic set in. After getting carried off the field, I was laid across a table outside the turf area to be examined by a teammate (who was the trainer at the local high school). That’s when I had what I can only describe as a panic attack (slight shock) not from the pain, but because I knew that whatever had happened was going to put me out of work and my upcoming trip to Australia. The first two weeks post surgery was a gut check for me. I definitely wasn’t in the best spirits for the first couple of days because I was realizing how much this would change my next couple months. And then I started reading everyone’s posts on this blog and thinking about how I was taking all of this. So, I decided that I could be negative and suffer through the next few hard weeks of waiting and PT, or I could use this time and opportunity as a vessel to personal, mental, and physical growth. So that’s what this is, it’s a return. It’s an opportunity to become stronger, so here we go. Sounds like you’re doing great, bigcatcher! Keep concentrating on getting your gait back to normal. Funny that that is something we have to concentrate on, but we really do! Glad things are progressing well! Congrats on your great progress, and your great attitude! Keep up the good work - you’ll be running and jumping in no time! Outside of the immense support and encouragement I have gotten on this blog, I realized early on that I could lay around for the next couple months feeling sorry for myself, or I can use this as a vessel to personal growth. So that’s exactly what I am trying to do. Way to go! I’ve been walking for 3 weeks and I’m still concentrating on doing it right. Amazing what your foot forgets to do after 6 weeks of not walking - LOL! Congrats on your great progress! It’s so nice to read such encouraging posts. It really helps me to stay positive. So, thanks! There is something called smart crutches as well. I have not used it, but someone mentioned in on my blog. If I am to ever need crutches again (hope not!) I might go for that (other than iWalk) if nothing new is invented. I was using iWalk2.0 most of the time though and loved it. I was doing everything on it. The important thing for me was precise adjustment of the iWalk angle at the set up time. This was making walking easy. Took few tries, but finally got it right. Having 2 free hands cannot be substituted by anything after all the pre-injury freedoms are taken away in that initial stage… I found shopping easy enough with it, since you can hold on to the cart. Other public places was something to get used to though. There was this weird special fear initially, but disappeared after a while. Thanks for the review, bigcatch! Might be helpful to many! For me, I’ll probably stay in the 1800s. The positive side of crutches, like you said, is that it’s a good upper body workout. Being now at 8 weeks, I now see that being positive helped push me to continue the exercises, push myself at the gym, and I feel that it helps pass the time overall. Now that I am full weight bearing and starting PT this week, things are starting to move a little quicker, however, I still find myself trying to push which I told myself I wouldn’t do. That’s just the athlete mentality I guess, its a blessing and a curse that I’ve seen from a lot of people on here. I like the attitude, too! I started saying that I’ll come out on the other side of this in better shape than ever, and I really believe it. I try to focus on good nutrition and resting well, and when PT comes along that’ll be another chance to improve. Hi Big Cat - welcome to the club! I like the attitude you’re taking, and hope that we all can look to the positive, even through the inconveniences we are experiencing with this injury! Remember, it’s just an injury. You hurt. You may or may not have surgery. You heal. You rehab. Life goes on, and you can choose to have a positive outlook! Stay strong! Happy healing! bigcatchronicles’s AchillesBlog is proudly powered by WordPress and WPDesigner..